August 22, 1964. Do young girls still read this wonderful book by Scott O'Dell - I certainly hope so. 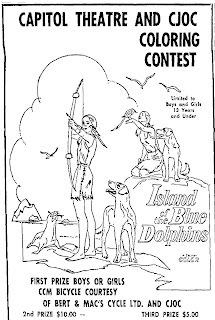 ISLAND OF THE BLUE DOLPHINS, the movie, received bad reviews but I LOVED it! The movie would come on television about once a-year when I was a pre-teen and teenager and for me it was an event. I remember seeing this movie in the theater and loving it as well. I would watch it every time it came on television and remember crying at some point in the film but I couldn't tell you what part made me tear up. Do You Remember H. R. PUFNSTUF?